Belarusization 2.0.: Will the Russian threat help Belarusization? On 2 March 2019 Alexander Lukashenka held his annual conference with journalists. The so-called “Big Conversation” lasted seven hours. The marathon session both clarified and blurred official positions on issues of security, closer integration with Russia, and Russian propaganda in Belarus. At the same time, in the context of recent discussions about the potential annexation of Belarus by Russia, Lukashenka’s public statements on the importance of preserving national heritage and language have grown more frequent. For example, Lukashenka asserted: “If you are the nation, you have to have your own language.” In recent months, he made a public speech in Belarusian, called on citizens to remember the Grand Duchy of Lithuania, and declared that Belarusian sovereignty will not suffer from blackmail and gas disputes. A policy of Belarusization may prove decisive in deterring the Russian world and protecting Belarusian sovereignty. However, a superficial Belarusization orchestrated by Lukashenka and directed at external actors could have a negative effect on Belarusian language and culture. Instead of genuine Belarusization and the development of the Belarusian language, such a policy only awakens Russian propaganda and leaves Russian language dominating education, the judiciary and the media. The Belarusian population continues to Russify more and more. 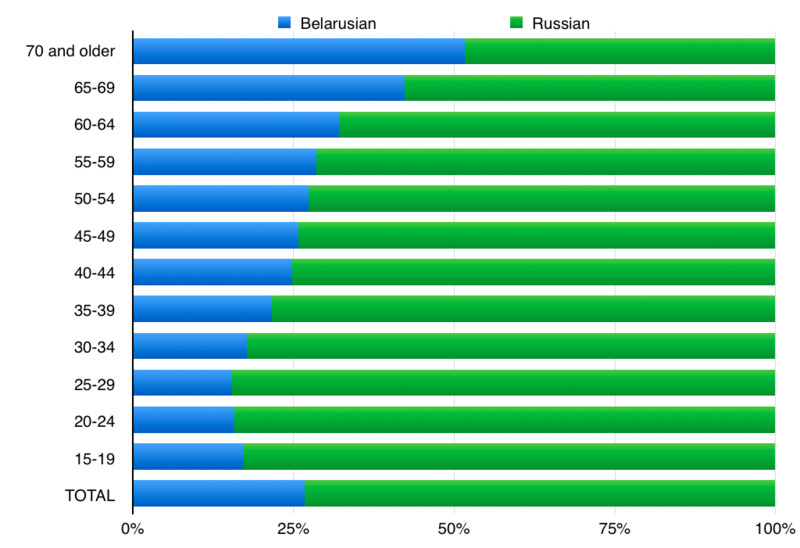 According to a 2018 study by the IPM Research Centre, only 2.2% of Belarusians speak Belarusian at home, while 73.7% use Russian; 12.3% speak both and 11.6% use a mixture of the two languages. According to recently published data from the 2009 population census (not previously published), the state of the Belarusian language has declined. The recent data demonstrates that only 57.4% of Belarusians named the titular language as their native language. With further Russification, the numbers speaking Belarusian may significantly decrease when data from the 2019 census is collected. A rapid Russification of the Belarusian population primarily occurs through Russian-language media. Three of the nine TV-channels included in the standard TV package are Russian and the rest use Russian as the main language. Belarus buys the majority of its TV shows from Russia and broadcasts these even on the Belarusian-language channels. Russian propaganda has a wide influence through the Russian TV channels that predominate Belarusian TV. Monitoring by the Belarusian Association of Journalists shows that promotion of the notion of a “Russian world” takes place through Russian TV shows of both political and non-political character and broadcast on the nine official TV channels in Belarus. Although experts continue to talk about the so-called “soft” Belarusization in the cultural and entertainment sectors, the use of the Belarusian language in state and education institutions continues to fall. The festivals of Vyshyvanka (traditional embroidered shirts), cultural events and growing usage of Belarusian language by business show an interest in the language rather than its development. Besides the Russification of the educational system, the growing interest of young people to the Belarusian language is competing with a brain-drain. 2018 marked a record year in so far as around 11,000 Belarusians emigrated to other countries for work, with a total of almost 95,000 Belarusians officially working abroad according to Mikhail Myasnikovich, the Chairman of the Council of the Republic, cited in Zviazda. In these conditions, English becomes even more popular than Belarusian for young professionals, as does Polish among workers moving to Poland. On 25 March 2018 Minsk saw one of the biggest celebrations of Freedom Day, organised through crowd-funding. The peculiarity of the event was that the authorities approved the celebration – in contrast to many other events organised by oppositional leaders in the past. 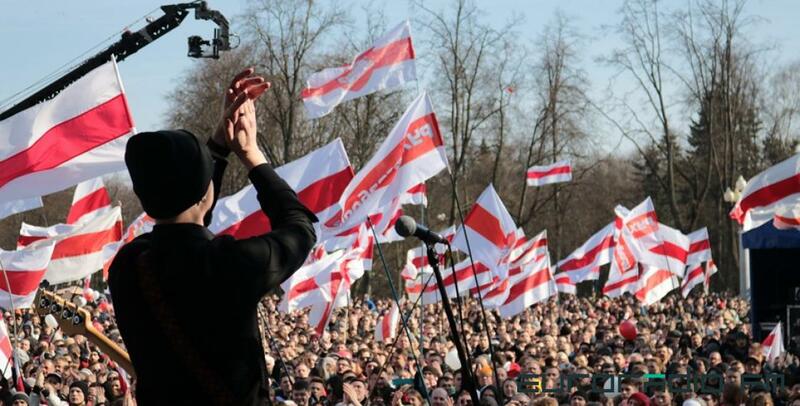 Last year’s Freedom Day BNR 100 (the centenary of the foundation of the Belarusian Republic) appeared as yet another sign of soft Belarusisation and gave hope for some liberalisation in the country. This year activists applied to hold Freedom Day celebrations at the Dynama Stadium, which the authorities are preparing for the 2019 European Games. However, the authorities rejected this year’s application stating that the stadium is not yet ready for concerts. The Belarusian pop-singer Alexandr Saladuha subsequently received permission to perform in the stadium, which some oppositional activists see as a way of restricting their access to the stadium. During the “Big Conversation” Lukashenka also said that he sees no sense in celebrating Freedom Day 101 in the city centre. Although the pressure on the opposition and the initiatives referring to the Belarusian national idea continues, Lukashenka himself does not shy away from playing the language card. Thus, on 9 January Lukashenka delivered part of a speech in Belarusian. The Belarusian president has done this before, for example in 2014. During the “Big Conversation”, Lukashenka said he does not understand why Russia tries to spread its ideology of the Russian world in Belarus since Belarusians already think like Russians and speak the same language. The Belarusian language card serves Lukashenka who wants to quieten supporters of the national idea by showing he is not trying to Russify Belarus. The same card is played when it comes to relations with Russia: here it demonstrates sovereignty and difference from Russia. However, in one or another way, Lukashenka uses this card only to benefit the regime and can barely have a relation to the policy of Belarusization anymore. Lukashenka’s appeal for the importance of preserving the national language and culture appears as an attempt to strengthen his position by attracting the support of national and opposition forces in the event of Russian aggression. Additionally, he might aim to decrease negative rhetoric regarding his announcement to run again for the presidency (by presenting himself as an advocate of independence, language and culture). Lukashenka may believe that against the backdrop of Russian pressure he can attract more support from the part of the electorate that has never voted for him before. Although positive rhetoric towards the Belarusian language became more visible, there exists a lack of investments into the language popularisation in education and media. In fact, Belarusization turns into a political tool of foreign policy rather than a genuine movement. If the regime aims to deter the influence of Russian propaganda, Belarusization policy should first of all focus on real reform in all spheres and not mere symbolic steps. Lukashenka calms Kremlin down: No Belarusization here!